Hello my friends! This week I was reminded of some basic truths about being organized and focused: write stuff down. As I’ve mentioned my new job is challenging; there are a lot more things to keep track of and I have at least three times the amount of email to wade through. I tried using the Task feature in Outlook but I found that when I got super busy I ignored it. Then I tried creating an Excel spreadsheet but found the same thing: when busy I felt I didn’t have time to type up the task. And too often I was missing critical things in my email. So I grabbed one of my journals (the alphabet notebook discussed in this post) and on the bus on the way to work did a brain dump of all the things I could think of that needed to be done in the office. I didn’t stop until the bottom of page 2. And once I was done it felt great! So much lighter. And throughout the work day I could focus on one thing on the list at a time. I highlighted the ones that needed to be done right away. And marking them off as they were completed was awesome! Such a simple concept but so powerful. We have blank books at work for notes and such but I thought using one of my own would make me more invested and it seems to be working. Hurray! Another area where I needed focus and organization was picking out furniture for our new house. We sold or gave away most of our furniture before the move. Seems pretty straightforward but we have a limited budget and I wanted to make sure we spent the money wisely. So we started looking at furniture in different places: Pier 1, Wicker Emporium, Structube, Bombay Company. I took pictures of pieces that appealed to us. I made notes of what we agreed upon, what we loved, hated, were indifferent to. I had lots of photos on my phone and wanted to transfer them to a notebook where I could make notes. So I created what I call a Look Book. I chose one of the Bookblock Original notebooks (blank pages) and got my LG Pocket Photo Printer out. Remember that gadget? It still works great. I love how small but clear the pictures are. Perfect for my journal. In the picture above I’ve created a simple index on the left and pasted my pictures on the right. I can then put model numbers and dimensions next to the photo, as well as where we found it and how much it was. A great way to compare prices and the photos really jog the memory. Here you can see in closer detail the notes I’ve made about a certain piece. After viewing the piece in person I would look it up on the internet for the specifications, as well as any other pieces available in that line. I like furniture that matches! I used a black Staples OPtiFlow pen. Here’s a bunch of photos from another store, ready to place in my Look Book. I even printed a couple of photos of the cats, which will go in my regular journal. Love that little pocket printer! You don’t have to start a separate journal for a project such as this; I could have added these pages to my regular daily journal. But I wanted to keep these separate because I don’t know how long it will take us to a) find all the furniture we need and b) agree on what to purchase! It’s also a nice keepsake of one of the many house projects David and I will undertake together. How wonderful to be able to look back on the process a year from now, or 10 years from now. Update: we went shopping in yet another furniture store yesterday (Ashley Furniture) and bought furniture for the TV room, kitchen and dining room. Because we had already done some research I think it was easier for us to pick a style we liked and to know that the price we paid was a fair one. Of course we had to order everything so having the Look Book will help us greatly as we continue the search for furniture and accessories for other rooms, so we can keep the general style consistent throughout each room. Just one more great use for your journal! Hello everyone! Apologies for the two weeks between blog posts; it’s been a busy couple of weeks. But I really wanted to share this post with you today. I’m really excited about the product so couldn’t wait to share it with you, after it finally reached me (due to moving, sigh). Imagine being able to take any photo or piece of artwork and turn it into a journal cover! That’s what the folks at Bookblock in the UK do. They’ve been offering custom notebooks to brands and agencies since 2013. They recently added a new offering, Bookblock Original, which allows individuals to create a completely unique, one off notebook on their website, with full bleed digitally printed covers. And they have created custom notebooks for this website!! For about the same price as a Moleskine anyone can order a notebook with any artwork digitally printed onto the covers. The notebooks are printed in the UK on recycled paper. And the price includes shipping: $26 US or thereabouts. You can add your own photos or artwork plus graphic details such as stickers or speech bubbles. You can choose the colour of the elastic and the colour of the background (spine and edges). You can choose the type of paper: Ruled, Plain or Dot Grid on 90gsm ivory, or Sketch on 140gsm Cartridge. Back in February of this year the folks at Bookblock contacted me, to see if I would be interested in reviewing one of their notebooks. I agreed and the process began. We discussed artwork and ended up with them designing something around my blog name. I really love the finished product. Image Bookblock sent me during the customization process. It took awhile for the books to reach me. A LONG while. As I’ve mentioned here before we had some major problems with our mail forwarding. And the customer service at Bookblock were really fantastic about it. The three books shown above were sent to my previous address as we were starting the move process. And when I still hadn’t seen them by the end of May Phoebe at Bookblock sent me two more. So generous of them and I really appreciate it. In a crazy twist, BOTH packages arrived at my new address on the same day! Strange how the postal system works sometimes. First let me say the notebooks are gorgeous. The soft-touch, vegan leather covers are smooth and lovely to touch. They have collaborated with a bookbinder in the UK to create the hand-crafted notebooks in small batches. And the quality shows. Image from Bookblock. You don’t often see a white elastic and I quite like it! The binding is excellent; the book lays flat out of the box. I received two lined and three blank. There are several different kinds of custom notebooks you can choose from on the website: Monsieur Notebook, Moleskine, Castelli, GF Smith, and of course the Bookblock brand. The digitally printed notebooks look to be exclusively Monsieur Notebook (sound familiar? Check out my review of their notebooks here); all of my journals are Monsieur Notebook. Each notebook has a place for your details, but no index. The Moleskine A5 is slightly smaller than this notebook, which comes in at almost 6″ x 8″. Both notebooks are 0.6 mm ruling. The Moleskine has a pocket in the back cover; these notebooks do not. (It is a feature you can add with a custom order.) Both notebooks have an elastic and a ribbon but of course you can add your own combination with Bookblock, which I think is super cool. Blue and Green, Green and Pink, or Orange and Orange, it’s up to you. They actually have a long list of add-ons: in addition to the pocket you can add a custom presentation box (always an elegant touch), pen loop, belly band, and printed inserts. You could also have a full colour logo, foiled or debossed logo. These customizations are not all available for the one off notebooks. Now my poor photography looks even poorer against the beautiful images from Bookblock! But you can see in this photo the Bookblock notebook is slightly wider than the Moleskine. The ribbon on my much-loved Hobbit Moleskine is definitely fraying, compared to the brand new ribbon on the Bookblock notebook. Time will tell if this ribbon will remain so pristine. No notebook review would be complete without the ink test! The paper is 90 gsm as mentioned previously, and it takes fountain pen ink relatively well. You’ll notice I smeared the ink on purpose to test the drying time and it is about 4 seconds. The Waterman Kultur pen didn’t show feathering but the other fountain pens definitely did. The blue ink above is Waterman Serenity Blue in a Waterman Kultur. I was very impressed with the performance on this paper. 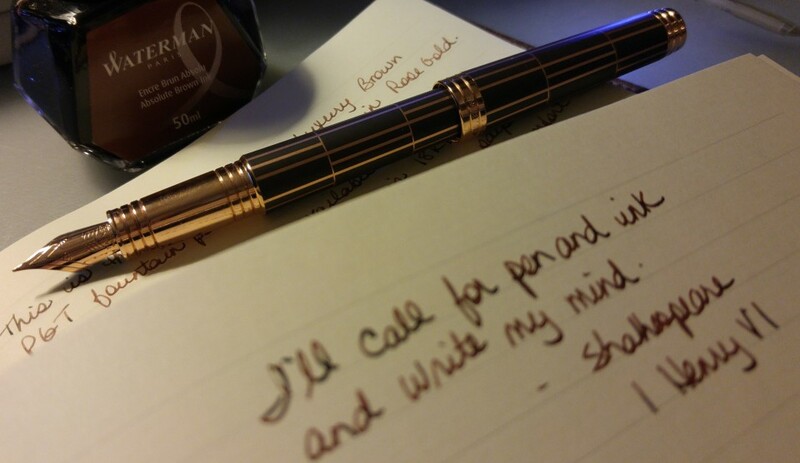 The gel ink of the Pilot Coleto was perfect but then again it’s always perfect! And actually every other writing instrument (gels and highliter and pencil) looked flawless on this paper. I was surprised at the feathering with the TWSBI and the Visconti, inked with Waterman Absolute Brown and Paradise Pen Vineyard Burgundy respectively. It’s not terrible but definitely noticeable. Arguably the Jinhao is the wost for feathering, and understandable I guess because it has the wettest nib of the three pens. Again it’s a Waterman ink: Inspired Blue. A bit of show through but not the worst I’ve seen, that’s for sure. Undeterred by feathering I wrote three pages with my Waterman Kultur (review coming) and I think the writing looks great. Really enjoyed the writing experience; paper is smooth and the Kultur sailed over it. The messy bit at the very top of this page was created by me, trying to get one of my pens to start writing. I was disappointed that the fountain pen ink had such varied results in terms of feathering. I also would have liked an index. As a notebook collector I have a number of A5 journal covers, it being my size of choice. It’s too bad that these notebooks are an inch too wide to fit in a standard A5 cover. Having said all that, I do not hesitate in recommending this company. They did provide me with free notebooks but that did not sway this review. My words and thoughts are my own. They wanted honest feedback and I have given it. I like how individualized these notebooks can be and I do not think the price is too high, considering it includes shipping. The customization possibilities are vast and if there is something you want but can’t figure out on the website their customer service team is excellent. And the books are excellent quality that take fountain pen ink reasonably well. If you want one custom notebook or one thousand, check out bookblock.com and bookblock.com/original.